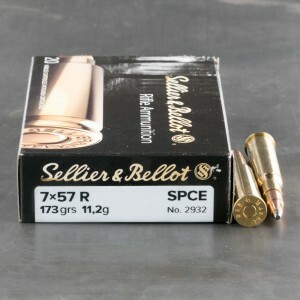 7x57R ammo is known by many names. In the USA the round is often known as the 7mm Mauser, The 7x57 mm Mauser, and even the 7mm Spanish Mauser. In Europe, the round is typically called .275 Rigby. This is a bit of a reversal, since most European countries use the metric system in naming cartridges. 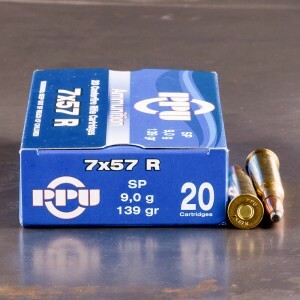 The 7 x 57 Mauser is a potent cartridge, and was designed in 1892. The round was conceived by Paul Mauser of the famed Mauser arms collective. The round was adopted by the Spanish military, and gained the Spanish Mauser name. Today, 7mm Mauser may have fallen out of military use, but it has remained popular with hunters, as well as bolt action rifle enthusiasts. The round’s military loading, 173 grain round was capable of reaching 2,300 feet per second. The lighter 139 grain round can reach up to 3,000 feet per second.